Mid-Autumn Festive is also known as The Day of Reunion, a time to gather family, friends and loved ones and create memories of togetherness. Festive season are also a great excuse to indulge and this season, it’s all about mooncakes. 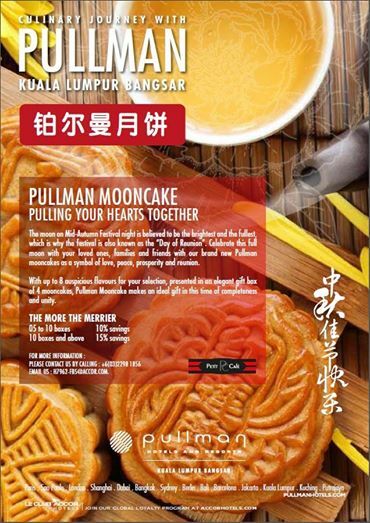 Visit Pullman Kuala Lumpur Bangsar this season as the hotel celebrates their first year of Mid-Autumn’s Festival of completeness and unity with 8 auspicious flavours of traditional baked mooncakes. The scrumptious traditional baked mooncakes are presented in an elegant gift box of four. In theme with the auspicious season, the gift boxes are red, black and gold. The 8 varieties of traditional baked mooncakes range from the classic favorites to a few modern flavours. Enjoy these with hot Chinese tea with family and friends to create precious memories. Classics like Lotus Paste and Lotus Paste Single Yolk will always be much appreciated by many. The deep rich flavour of creamy lotus seeds exudes earthy nutty notes. Coupled with the ever loved salty duck egg yolk, the nuances of sweet and savory is always a sure winner! Red Bean Paste is another one that still remains much in demand. Sweetened and creamy red beans evoke nostalgia flavours where back then, these humble beans provided much satisfaction as a filling as we as flavour. If you like lotus but prefer a more refine flavour with delicate aroma, the White Lotus Single Yolk maybe just up your alley. Coupled with bits of melon seeds, the delicate nutty white lotus paste with savory duck egg yolk work wonders on the palate. Jade Custard is a popular choice of many including mine. Aromatic pandanus leaves stood in the limelight with a center of set egg custard is another great combination that always appears in many places. Of course there’s a reason for this as the flavours are always welcomed by many who enjoy aromatic pandan and egg flavours! Black Sesame White Lotus Single Yolk has an old school touch of rich nutty black sesame paste balanced up with the delicate white lotus paste. The single yolk then proceeds to make this combination more decadent and delicious. Two modern flavours that uses fruit to draw out another level of flavours are Dragon Fruit & Coconut Single Yolk and Honey Grapefruit & Mixed Nuts. Dragon Fruit & Coconut Single Yolk is pretty at sight and tasted elegant in flavours. Though there’s barely much dragon fruit flavour since its not obvious in the fruit anyway, the coconut layer is very much delish. I wished for more coconut filling as it is very aromatic and goes really well with the duck egg yolks too. Honey Grape Fruit & Mixed Nuts are for those who enjoy a light citrusy note of the bittersweet grape fruit and nutty texture. This one is easy to enjoy as it has the citrus flavour to counter the usual sweetness and the earthy nutty mixture of nuts for texture component. Available from August 8 to September 8, 2014, Pullman Mooncake can be purchased from the hotel’s Petit Café located at the main lobby (Level G) between 8.00am to 10.00pm. To entice the familiarization of the delicious treats, Pullman is offering the mooncakes at very attractive prices, starting from as low as RM11.50+ per piece to RM16.50+ per piece. Patrons can select any of the 4 flavours to make up the purchase of a box. Purchases of more than 5 boxes are entitled to 10% discount and above 10 boxes are entitled to 15% discount. Order form is available here. That's cheap!!! Most would go up to at least RM15 and above.